Will Africa be the world's next hub of manufacturing? China is answering in the affirmative and investing accordingly. This book dispels the notion that this crucial story is merely about China's exploitation of Africa's resources, illuminating deep questions about our own, Western approach to development, and the implications for the future of manufacturing. China is now the biggest foreign player in Africa: largest trade partner, largest infrastructure financier, and fastest-growing source of foreign direct investment. Chinese entrepreneurs are flooding into Africa, investing in long-term assets, such as factories and heavy equipment. The fact that China sees Africa not for its poverty but for its potential wealth is a striking departure from the attitude of the West, in particular the United States. For fifty years the West has engaged in countless poverty-alleviation and development-aid programs in Africa, yet Africa still has the largest number of people living in extreme poverty of any region in the world. Considering Africa's difficult history of colonialism, one might suspect that the current story of China in Africa is merely a story about exploitation of resources. 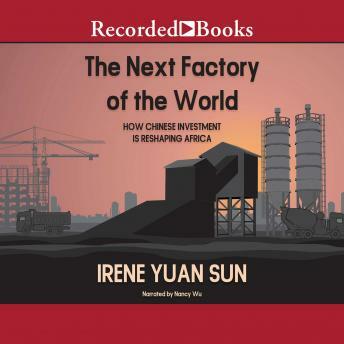 Author Irene Yuan Sun follows these entrepreneurs and finds, instead, that they are factory owners, building in Africa what they so recently learned to build in China-a global manufacturing powerhouse. This gives rise to a tantalizing possibility: that Africa can industrialize in the coming generation. With a manufacturing-led transformation, Africa would be following in the footsteps of the United States in the nineteenth century, Japan in the early twentieth, and the Asian Tigers in the late twentieth century. Many may consider this an old-fashioned way to develop, but it's the only one that's proven to raise living standards across entire societies for generations. And with every new Chinese factory boss setting up machinery and hiring African workers, that possibility becomes more real for Africa. With fascinating stories of entrepreneurs, workers, and government officials in Africa, along with incisive business and economic analysis, The Next Factory of the World will make you rethink both China's role in the world and Africa's future in the globalized economy. Very good book; offering in-depth analysis of Chinese investment in manufacturing and their hard work in Africa. Eye opening. Her argument on eco development and labor exploitation, environmental damage etc is insightful.